The Center for the Integration of Research, Teaching, and Learning (CIRTL) provides resources, trainings, and networking opportunities for graduate students from the start of graduate school through to the job market. Graduate students are invited to participate in local on-campus offerings and national online cross-network opportunities to develop their teaching. How do you access CIRTL offerings? Subscribe to the CTL email list and the CIRTL newsletter to stay up to date on CIRTL resources, training, and networking opportunities. The Center for the Integration of Research, Teaching, and Learning (CIRTL) is an NSF Center for Learning and Teaching in higher education that includes 41 research universities. CIRTL promotes the development of future STEM faculty committed to implementing and advancing effective teaching practices for diverse student audiences as part of their professional careers. The Network offers free online and in-person professional development resources. 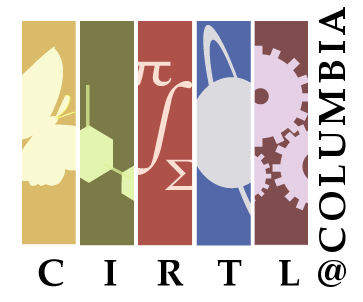 Columbia joined CIRTL in May 2016, and the CTL hosts local CIRTL offerings and produces programming for the CIRTL network. Learning-through-diversity: Learning-through-diversity capitalizes on the rich array of experiences, backgrounds, and skills among STEM undergraduates and graduates-through-faculty to enhance the learning of all. It recognizes that excellence and diversity are necessarily intertwined. Teaching-as-research: Teaching-as-research is the deliberate, systematic, and reflective use of research methods by science, technology, engineering, and mathematics (STEM) instructors to develop and implement teaching practices that advance the learning experiences and outcomes of both students and teachers. Learning Communities: Learning communities bring together groups of people for shared learning, discovery, and generation of knowledge. To achieve common learning goals, a learning community nurtures functional relationship among its members. CIRTL is comprised of 41 member institutions across the U.S. and Canada. View all the member institutions here. CIRTL offerings are intended for graduate students and postdocs in STEM and Social Science disciplines who are interested in enhancing excellence in undergraduate education through the development of a national faculty committed to implementing and advancing effective teaching practices for diverse learners as part of successful and varied professional careers. Though the Network emphasizes its role in preparing future faculty, faculty new to teaching would benefit from CIRTL as well. Develop the skills to implement best practices to achieve defined learning goals. Leverage the literature associated with teaching and learning by participating and contributing to on-campus and online learning communities of graduate students. Apply research skills to enhance and inform their teaching, and apply their teaching skills to better lead and communicate their research. Engage the diversity of their students to enhance the learning experience. Connect and find mentors among future and current faculty across the CIRTL network. STEM graduate students and postdocs can visit the CIRTL website to sign up (top right corner) and create a profile. Joining the CIRTL community is a great networking opportunity. Graduate students will be able to access online courses, resources, job postings, and the opportunities listed below. Should you have any questions about CIRTL, contact Chris Chen, Assistant Director of Graduate Student Programs and Services and CIRTL Institutional Leader, Center for Teaching and Learning at cc4210@columbia.edu.